Want to know something cool about this picture below? I was running along Salmon Creek Trail when I came across a patch of wild flowers. 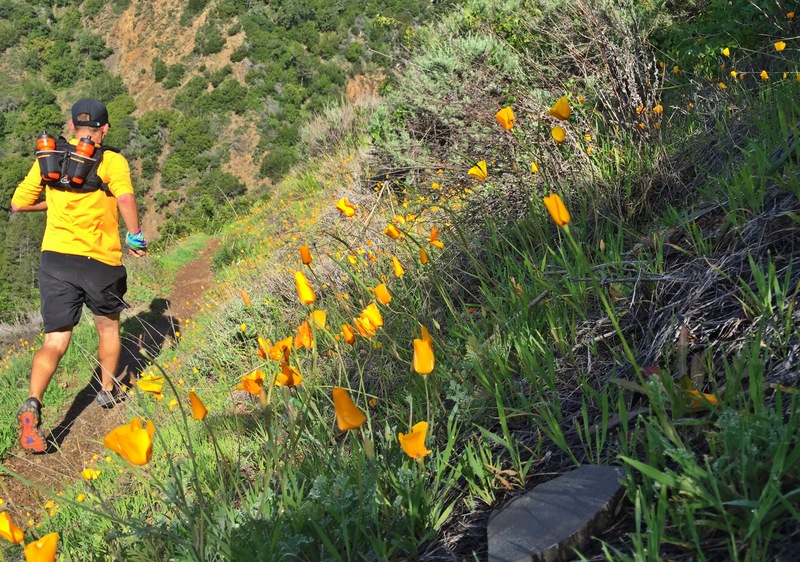 It wasn’t the first patch of flowers I ran pass as I climbed the switchbacks of the Los Padres NF trail in Big Sur California. It was however the first spot on the top of the ridge that I noticed a perfectly placed rock that would be a great spot to setup my phone to capture the beauty. After three takes (every runner knows two takes is not enough) of bending down to hit the camera timer I got a weird feeling, a feeling of being watched. I told myself to stop being stupid bending over so many times this far out in the mountains alone. I picked up my phone and started to run the amazing single track again. Shortly after coming into a fully tree covered section I stopped to walk after hearing a noise and getting that feeling again. Maybe it was the creek flowing, or just a bird or squirrel, at most a deer I told myself. Going the short distance to the creek crossing I stopped again to check my phone for the time. At this point I had been gone for an hour and half so I decided to head back to the van to get pup. As I put my phone away and turned around I was greeted by a mountain lion 25 feet in front of me! “Holy sh*t you’re big” I yelled! The expression on the lions face once it noticed I noticed it was almost cartoonish. With out hesitation it took off down the trail and up into the brush. As it ran away I yelled again, “NO! That’s the way I need to go!” I stood there for a few minute in shock. It seriously looked dumb founded I turned around…was it stalking me? It just went the way I need to go back…how long do I wait? I walked waving the branch and talking nonsense until I came to what I remember would be open trail back to the trailhead. Remember, don’t bend over a bunch of times on the trail for a silly picture. Don’t run solo for hours on end in bad cell phone reception areas. Pssh, who am I kidding…just make sure you don’t get eaten by a mountain lion! **Disclaimer** No running shorts were soiled during or after the sighting of the mountain lion. Very true! He is an old man now so I always make sure he’s in front of me when we hike. Phew! Quite the surprise! I am off to CA soon where I walk my daughters dog in County Park where those critters roam. I have not seen one yet, but know they are there. Think I shall walk softly but carry a big stick, just in case. Hey Peggy!!! 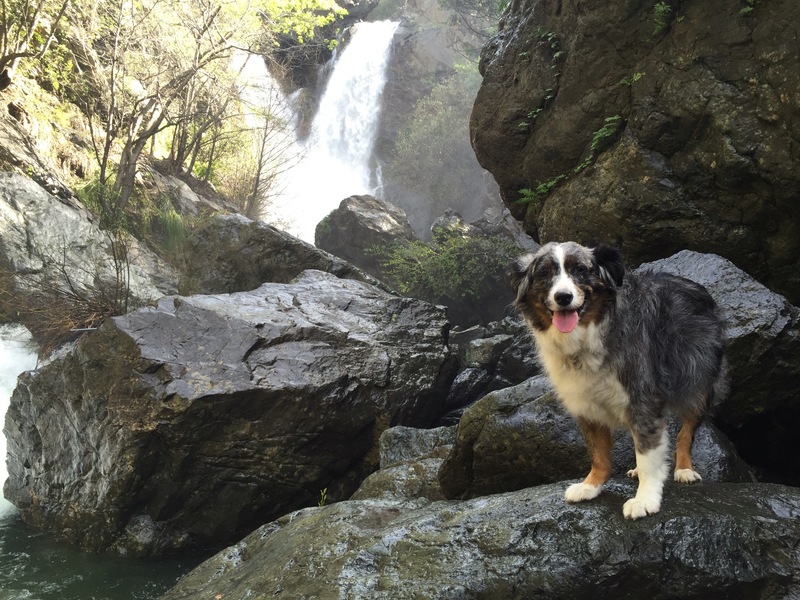 Where is county Park in CA? Spring will coming soon, I’ll try to send some your way! Enjoy CA! They’re not man-eaters, or you’d not have lived to tell the tale. What they are is a super-abundance apex predator in CA that primarily eat deer unless they were orphaned so young they never developed the skill to do so, or are so old they no longer can. I spent twenty-five years calling mountain lions to the camera by making noises a Blacktail fawn makes, and have photographed just three in all that time. Called dozens I never saw but for tracks seen afterwards where they had snuck in. Never have I had one keep coming once it detected I was a human and not a fawn. I am honored to have seen it! The look on its face literally was complete shock that I noticed it and it showed exactly what you wrote. It took off quickly. I would love to see your photos of the lions…do you have a site?